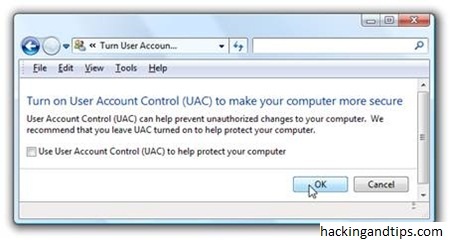 Go to Control Panel, and type in “UAC” into the search box,you’ll see a link for “Turn User Account Control (UAC) on or off”. Click on it. 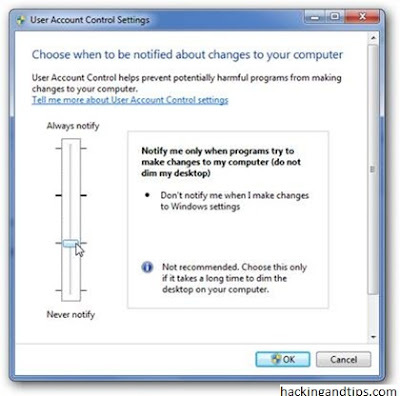 On the next screen,just uncheck the box for “Use User Account Control (UAC)”, and then click OK button. Restart your PC to see the effects,no more UAC prompts..YAY !! Looks like Microsoft learn with the failure of Windows Vista and made it quite easier to to deal with UAC settings in Windows 7, and in fact you don’t have to completely disable UAC if you don’t want to. Just type UAC into the start menu or Control Panel search box. Now you can simply drag the slider up or down, depending on how often you want to be alerted. To disable it entirely, just drag it all the way down.